This weekend we braved one of the worst drives up to the Twin Cities that we've ever had (it was snowing, it was rush hour and the roads were not cleared at all). It took us almost 4 hours to get to my parents house. It turned out to be worth it though because we had a lovely weekend with my parents and Benjamin was able to visit with the man in the red suit twice. 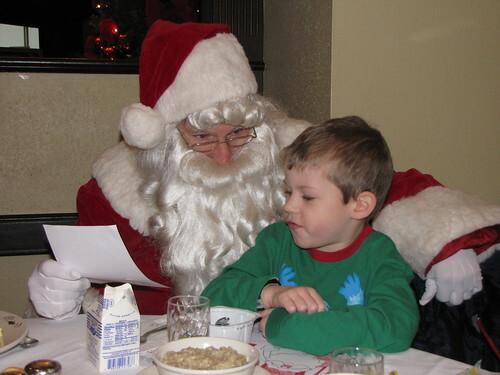 The highlight of our weekend was Breakfast with Santa at Macy's Sunday morning. This is the fourth year Benjamin has been able to experience this event (once in IL and three times in MN) and it gets more and more fun every year. He's at that lovely age right now where he is old enough to truly look forward to Christmas, but he also is innocent enough to still believe in Santa and all of the magic of the season. Lucy had her two month regular doctor's appointment today. We were excited to see how much she's grown. It turns out that she's still just a little bit of a thing as her length (20 inches) is under the 3rd percentile and her weight (9 lbs, 11 oz) is in the 22nd percentile. However, her rate of growth and the proportion of her height to weight is fantastic, so her doctor took her off of the extra calorie formula. Gone are the days of microwaving water to heat up her pre-mixed, cold formula! We are very pleased. The doctor was very impressed with her sleeping habits. She has been sleeping through the night from about 8:30pm-6:30am, which is way beyond what she should be doing at this age. Saint Nicholas visited our house Sunday night and the kids opened their stockings Monday morning before school. Lucy got some Christmas pj's and some car seat toys and Benjamin got a "Santa Rocks" shirt, guitar socks and the Toy Story 3 DVD. Saint Nick's Day is a tradition from my family that we've continued since Benjamin was born. Not many people celebrate it, especially non-Catholics, but we enjoy the holiday!